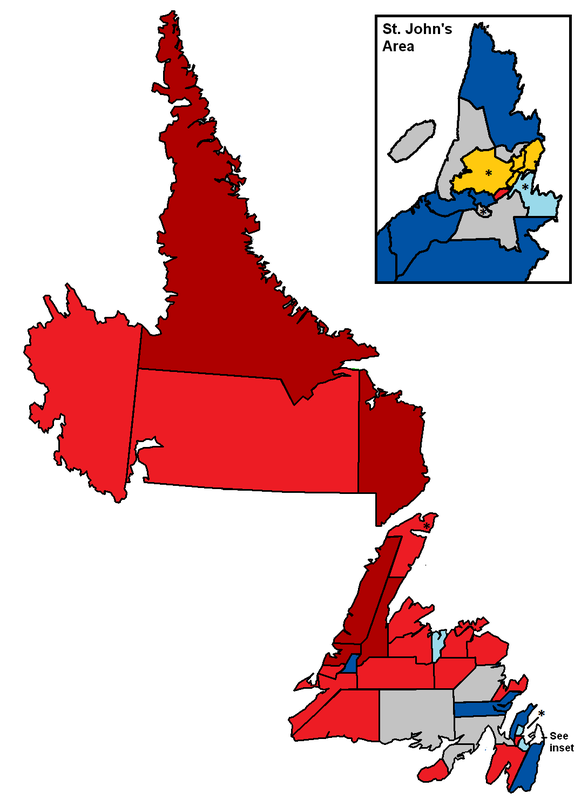 Per this morning's Abacus poll for VOCM, conducted in the days following Kathy Dunderdale's resignation, here's what the notional electoral map would look like. The Liberal seat count would be at least 25, including one notional win in St. John's, with another eight potential pickups, not including seats which the caucus has already picked up through floor-crossing and a by-election. The incumbent PCs would struggle to retain a caucus of more than ten, though they would save the furniture in their traditional northeast Avalon chateau-fort. The NDP, despite the Troubles, and despite being well off their record-breaking polling highs of 2012 and 2013, would notionally hold onto a caucus of at least three. Dark colours indicate holds. Light red indicates notional Liberal pickups, while light blue indicates narrow PC holds. Grey indicates districts where the forecast models are in disagreement about the notional outcome. * The models do not take into account changes in party affiliation of the incumbent (St. John's North, St. John's South, Mount Pearl, Straits and White Bay North), nor a seat which has changed hands in a post-2011 by-election (Carbonear–Harbour Grace). It also does not account for the impact of likely pre-election vacancies (Virginia Waters) or incumbents who choose not to re-offer (Humber East).